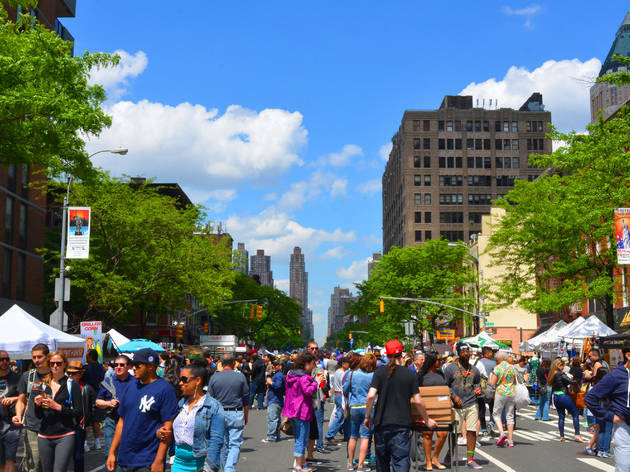 We hope you’re hungry (and thirsty), because there are a ridiculous amount of food and drink festivals this weekend in NYC. From pancakes and coffee to beer and veggie burgers, here’s where you should plan to go, no matter what your gustatory interests are. Head to The Well in Bushwick for an all-you-can-drink tasting of over 100 small-batch beers, made exclusively for the event by 50 different breweries. You’ll be able to appreciate the nuances of craft beers and even squeeze in a little dancing with live music. 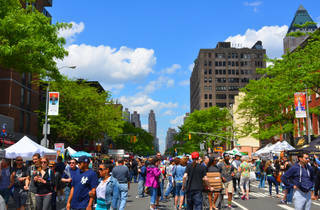 Raising funds for local and national charities, this festival takes over 15 blocks on Ninth Avenue and fills them with some of the city’s best street eats and food trucks. With options like Bali Nusa Indah, BarBacon, Chelsea Grill, Southern Hospitality and Poseidon Bakery, you’re sure to get a good taste of the block. Call all your meat-free friends and head to the Metropolitan Pavilion in Chelsea for the eighth annual celebration of all things vegetables, where there will be plenty of food and cooking demonstrations. Hold off on your morning cup of joe and drag yourself over to the New York Hilton Midtown, where you’ll be able to get your caffeine fix with tastings and attend seminars to learn everything there is to know about java from the pros. Located at the O’Shea Complex Schoolyard, this festival gathers 40 of the Upper West Side’s best eateries and throws them under one giant tent. Feel good about indulging, since all proceeds go to improvement and beautification projects in the neighborhood. The Brooklyn Expo Center in Greenpoint is hosting this brunch-focused festival, where past participants have included Chalk Point Kitchen, Butter & Scotch and Manousheh. If the grub isn’t enough, there will be open bar of mimosas or Bloody Marys to start your day off right.